I get invitations to submit articles to a variety of journals that I have never heard of and whose supposed field of interest may bear little relation to my intellectual biography. The invitations come about as often as the notifications of winning lottery tickets or other windfalls. More than a decade ago, librarian Jeffrey Beall began to compile lists of the “publishers” who put out these “journals” to profit from what authors pay to get published under the widespread need for academics to “publish or perish”. Beall no longer updates the lists and the web site is no longer operative, but a late version is available courtesy of the Wayback Machine. Abstract: A system of quantum field dissipating void and a parallel system of quantum field and void system that contribute to the dissipation of the velocity of void is investigated. It is shown that the time independence of the contributions portrays another system by itself and constitutes the equilibrium solution of the original time independent system. Methodology reinforced with the explanations, we write the governing equations with the nomenclature for the systems in the foregoing. Further papers extensively draw inferences upon such concatenation process, ipsofacto. Significantly consummation and consolidation of this model with that of the Grand Unified Theory is the one that results in the Quantum field giving rise to the basic forces which is purported to have been combined at the high temperatures at the Big Bang Vacuum energy is reported to be the reason for the consummation of the four forces at the scintillatingly high temperature. It may be obvious why this reminds me of the hoax that Alan Sokal perpetrated on the journal Social Text. “The academic community has long been demanding more transparency, choice and accuracy in journal assessment. Currently, the majority of academic output is evaluated based on a single ranking of journal impact. African Quality centre [sic] for Journals (AQCJ) perform this job as precisely as possible. Impact Factor is a measure reflecting the average number of citations to articles published in journals, books, patent document, thesis, project reports, newspapers, conference/ seminar proceedings, documents published in internet, notes and any other approved documents. It is measure the relative importance of a journal within its field, with journals of higher journal impact factors deemed to be more important than those with lower ones. 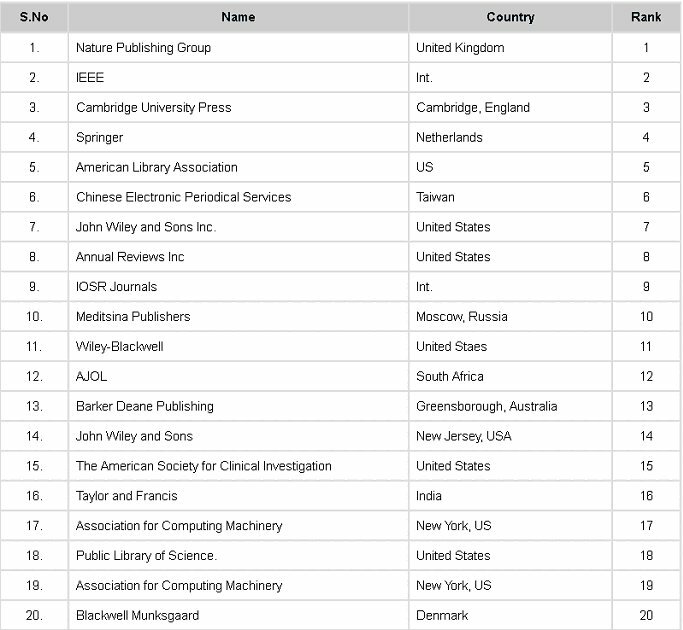 Ø Citation : The impact factor for a journal is calculated based on a three-year period, and can be considered to be the average number of times published papers are cited up to two years after publication. Ø Originality : AQCJ checks random selects published article’s originality and quality. Only citation is not perfect way of Impact factor calculation. Ø Time publication : Periodicity of publication should be uniform. If it is not uniform, the quality of particular publication cannot impressible. Ø Geographical coverage : Only particular small area based publication cannot get good marks as it is not covering all around world research. At a cursory glance, noting Nature, Cambridge, Springer, Wiley, this might briefly pass muster as plausible, until one looks more closely and decides to check up on, say, “Barker Deane Publishing” in Australia which is ranked above Taylor & Francis; Barker Deane Publishing specializes in “Self publishing and publishing for health, spirituality, positive living, new age”. The website of the African Quality Center for Journals did not offer me a way to discover its possible connection to IOSR, but I suspect quite strongly that there is one. The syntax on the two web sites is rather strikingly congruent. This entry was posted on 2017/04/06 at 12:17 pm	and is filed under fraud in science, media flaws. 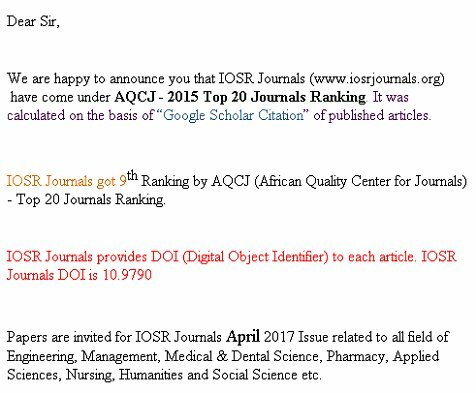 Tagged: African Quality Center for Journals, AQCJ, fake rankings of journals, fake science journals, International Organization of Scientific Research, IOSR, Predatory publishers. You can follow any responses to this entry through the RSS 2.0 feed. You can leave a response, or trackback from your own site.